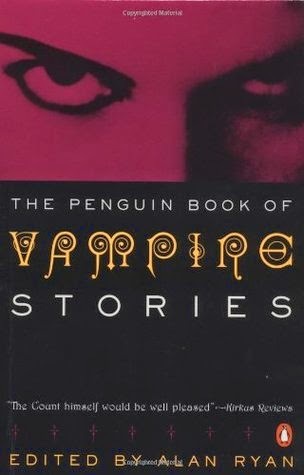 THE PENGUIN BOOK OF VAMPIRE STORIES is one of the best anthologies I've ever found. Part of the reason is that it covers authors who've touched on this subject as far back as 1816 and goes up to 1984. There are a number of familiar names in this book like Clark Ashton Smith, Sheridan Le Fanu, Tanith Lee, and August Derleth to name just a few. But what fascinates me the most is seeing how the vampire legend is explored. We meet the legendary "Varney The Vampire", the seductive and dangerous "Carmilla", as well as Stoker's missing chapter from Dracula which was released as a short story several years after the novel itself was published. I understand in some later printings, it was put back into the novel where it belonged. Alas my copy of Dracula is one of the ones without it, so finding this missing chapter in this collection was a treat for me. The first 2 installments in this collection: "Fragment of a Novel" (1816) and "The Vampyre" (1819) were of particular interest to me since their creation were the direct result of a bet made between the poet Percy Shelley, his wife Mary, Lord Byron and John Polidori. The four were spending a summer together and during a particularly boring rainy night they all agreed to a little contest. Each was to create a full length horror story within a certain amount of time. These 2 stories were the entries by Byron and Polidori respectively. Neither is fully finished. In fact Mary Shelley was the only one to complete her story the legendary "Frankenstein". Sheridan Le Fanu's "Carmilla" is another brilliant piece in this collection. Published in 1872, it predates Stoker's more famous "Dracula" by a few decades. Considered a 'lesbian' vampire story since both the victims and the antagonist are women. But it's here where we really find one of the first demonstrations of the sensuous behavior that has been built upon by so many modern writers of vampire fiction. Yet, it is not love or real affection. I'll quote a passage from the story so you can see what I mean. its object, overpowers with violence, and strangles and exhausts often at a single feast..."
So here we see that alluring nature that is so eroticized these days. But clearly in this passage we see that clearly there is no real affection for the victim at all. It's fascinating to see how one idea is singled out and made romantic, while the consequences are ignored these days. However, I cannot criticize modern writers for this. Every author wants to put a different spin on an old legend and this can be seen throughout this collection. We have "Luella Miller" by Mary E. Wilkins-Freeman in 1902. No blood letting here, but the title character definitely has a kind of vampiric nature, willing or otherwise. She is almost a sympathetic character in some ways. Later we find C. L. Moore's "Shambleau" in 1933, where the author takes us on a science fiction journey to another planet where we meet a vampire-like being, who also shares some resemblance to the legendary Medusa of ancient Greece. There's also the legendary Fritz Lieber's offering "The Girl With The Hungry Eyes" from 1949. Or August Derleth's 1939 "Drifting Snow" where we meet a pair of Snow Vampires.